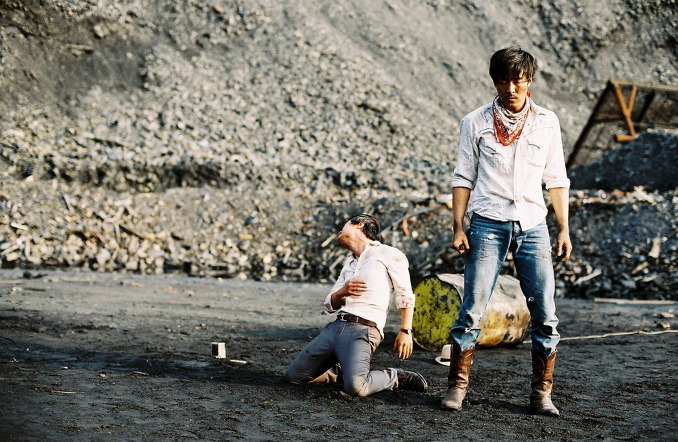 Premiering at the 2011 Puchon International Film Festival, director Ji Ha Jean’s (지하진) Bloody Fight in Iron-Rock Valley (철암계곡의 혈투) was particularly well received. Indeed, the low budget spaghetti western homage earned several awards during its run at PiFan including Best Korean Independent Film, European Fantastic Film Festival Asian Award as well as the Fujifilm Eterna Award. It’s not hard to see why; the film is a genuine love letter to the classic westerns of Sergio Leone with the nameless outsider-redeemer hero, a town besieged by corruption, and a pretty prostitute with a heart of gold. The Morricone-esque soundtracks for the characters add even further reverence to the respectful homage, heightening the tension of the violent quest immensely. While the budget limitations hinder the storytelling and certain areas require further development, Bloody Fight in Iron-Rock Valley is a thoroughly entertaining indie western. Finally released from serving a 12 year prison sentence, the man with no name (Lee Moo-saeng, 이무생) begins his quest for revenge. After dispatching a police officer and a gangster in brutal fashion, the man travels to a sleepy backwater town in Gangwan-do in pursuit of his final targets – Ghostface (귀면, Yoon Sang-hwa (윤상화) and Axe (도끼, Kwak Ja-hyeong (곽자형). Yet upon his arrival the man discovers the town is plagued with corruption due to gambling dens presided over by a crippled boss, causing destitution in its wake. As the nameless man violently brings justice to the town, he encounters prostitute Tae-yeon (태연, Choi Ji-eun (최지은) and wild man Pan-ho (판호, Ji Dae-han (지대한), who join forces for a bloody showdown in iron-rock valley. There is much to admire about Bloody Fight in Iron-Rock Valley. The film is a pure and sincere tribute to the western genre, and even film noir classics such as Chinatown, albeit with a Korean twist in the form of the violent revenge thriller. Writer/director Ji Ha Jean amalgamates the features of each incredibly well as the lone anti-hero pursues justice against the corrupt, eliminating them with appalling methods ranging from knives, beatings, and even flame throwers to the mouth. Yet Ji Ha Jeon never allows for the action to subsume the story, continually reinforcing the reasons for such violence through teasing flashback sequences and props a la Once Upon A Time In The West. The references to Leone’s westerns are hugely enjoyable, from the mysterious musical box that holds the key to the past, through to the nameless man dragged through the streets by his neck (via motorcycle), and identifying such sequences are a real thrill for fans of cinema. The villains, branded with pseudonyms rather than names, also hark back to the miscreants of the ol’ west as criminals that have ultimately been acquired by corporations intent on consolidating power. In this respect Ji Ha Jeon also aligns the film with Korean cultural concerns. Just as the change from wilderness to civilization is a key theme in the western, the director relays this sensibility through Korea’s rapid urbanization. Such disparity is represented well, with wonderful cinematography of the natural misty landscapes from which the nameless man emerges, contrasted with the dilapidated houses and dark quarry pits of industry. The powerful corporation at the source of the transition, headed by a symbolically crippled boss, abuses the land, the community, and Korea’s religious and cultural heritage in the form of a Buddhist temple. The ongoing crimes of the syndicate pull other outsiders into the conflict, making for some engaging, and cathartic, violent confrontations. Yet aside from the genre pastiches and violence, the restrictions imposed by the shoe-string budget are quite clear. This is perhaps an unfair criticism as what director Ji Ha Jean has achieved with Bloody Fight in Iron-Rock Valley – which was filmed in a month – is remarkable, and the rough-around-the-edges sensibility actually adds a great deal of atmosphere to the film. However, the narrative is in general need of further development particularly in regards to villains and their machinations. Of all the bad guys, Ghostface stands out as the most ruthless and sinister, and his stoicism is competently performed by Yoon Sang-hwa. The other henchmen are merely stereotypical fodder for the nameless anti-hero to challenge and overcome, and in the case of the boss’ son, a general annoyance. The boss himself is woefully underwritten, and rather than a power hungry nefarious fascist he is something of a kindly old man which is frankly bizarre. The gravest underdevelopment however is reserved for the ultimate goal of achieving power in the area, a pivotal feature of the plot and of prior westerns, as the personal vendetta of the anti-hero becomes one that redeems the town. As this element of the narrative is rapidly passed by there is never the sense that the quest has saved a community, and is therefore lacking in compulsion. Luckily however the finale of Bloody Fight in Iron-Rock Valley features all the classic hallmarks of the western genre, and is downright disturbing as the tragedy of the man with no name is revealed. The confrontation between him and Ghostface in the quarry is full of tension, and is a fitting final tribute to the spaghetti westerns of yore. Bloody Fight in Iron-Rock Valley (철암계곡의 혈투) is a genuine love letter to the classic spaghetti westerns of Sergio Leone. Featuring classic features of the genre, including a nameless outsider-redeemer anti-hero complete with Morricone-inspired score, the independent film provides a huge service for fans of cinema. Director Ji Ha Jean (지하진) also combines Korean anxieties surrounding the rapid urbanization, making it a distinctly Korean production. The low budget and underdeveloped script hamper the film, but Bloody Fight in Iron-Rock Valley is otherwise an enjoyable, and entertaining, take on the modern western.